Former Prime Minister Atal Bihari Vajpayee died on Thursday at the age of 93 at New Delhi's AIIMS hospital. He was a charismatic and iconic leader of the Bharatiya Janata Party (BJP). He was known for his humble attitude and spot-less political career. A secular leader in its true sense, he respected and cared for all, across party-line and class barriers. He was the pioneer of the Bhartiya Janta Party. It was his leadership skills which drove BJP from 2 seats in Lok Sabha to a complete term of 5 years. His legacy proved that BJP could not only act as a strong opposition but also serve the nation as a ruling party with thumping majority. 1. 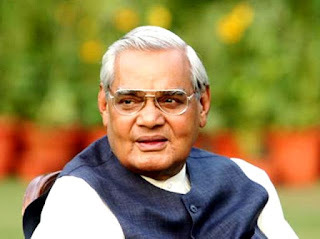 Atal Bihari Vajpayee was born on December 25, 1924 in Gwalior. 2. As a teenager, Vajpayee was jailed briefly for opposing British colonial rule. He flirted with communism before choosing to support the Rashtriya Swayamsevak Sangh (RSS) and the Jan Sangh. 3. Vajpayee dropped out of law school to run an RSS magazine in the early 1950s. Later, he transcended his political roots in the RSS to emerge as the moderate voice of the BJP. 5. Vajpayee became a close follower and aide to Shyama Prasad Mookerjee, the founder of the Bharatiya Jana Sangh (BJS), the BJP's predecessor. 6. Vajpayee was at Mookerjee's side when he went on a fast-unto-death in Kashmir in 1953 to protest against the system of carrying a permit for entering the state and the "inferior" treatment of Indian citizens visiting Kashmir, as also the special treatment accorded to Kashmir because it had a Muslim majority. Mookerjee's fast and protest ended the identity card requirement, and hastened the integration of Kashmir into the Indian Union. But Mookerjee died after weeks of weakness, illness and confinement in jail. These events were a watershed moment for the young Vajpayee. 7. Taking the baton from Mookerjee, Vajpayee won his first election to Parliament in 1957. 8. Vajpayee served the Lok Sabha, the lower house of parliament, for 10 terms that began in 1957 and concluded in 2009. 9. Vajpayee was the first head of government from outside the Congress party to serve a full five-year term. 10. Vajpayee first became Prime Minister in 1996 after four decades in opposition. He lasted only 13 days as prime minister for lack of numbers. The lack of a stable majority ended his second stint in power from 1998 after 13 months. His government collapsed after AIADMK supremo J Jayalalithaa withdrew her support from the coalition. 11. Riding high on the success of the Kargil War, Vajpayee was re-elected in 1999 at the head of a more stable coalition that lasted its full term. 12. An orator par excellence, Vajpayee had earned much fame as India's external affairs minister in Prime Minister Morarji Desai government during which tenure he delivered a widely acclaimed speech to the United Nations General Assembly in Hindi. 13. Undeterred by party hawks who accused him of embarking on a misdirected visit to Pakistan in 1999, Vajpayee rode triumphantly into Lahore aboard a bus. 14. He was conferred India's highest civilian honour, the Bharat Ratna at his residence on March 27, 2015. 15. A bachelor, Vajpayee was also a poet of repute and he was often quoted by his party.